The present book comprises a number of studies centered around the topic of how knowledge diffuses from one culture to another, and how knowledge diffusion is connected with the spread of languages and the conceptual systems they carry by translation. This diffusion also takes place also over linguistic borders, in the way that a given receiving language may also absorb systems of knowledge from languages that are linguistically quite unrelated but culturally connected with respect to knowledge transfer. Thus we find that Sumerian concepts with considerable impact were moved into the Akkadian language, along with writing-systems, religion, science and literature, even though linguistically the languages are completely unrelated. Another example is how Chinese culture and writing systems spread throughout East Asia into Korea, Japan and Vietnam, though the languages of these countries were linguistically unrelated to Chinese. The same case can be made for Buddhist ways of thinking when it was clothed in the garb of Chinese or Tibetan, or one of the other languages along the Silk Road. This is also true for the spread of Manicheism, as it was portrayed in a great number of languages, related or unrelated. German and Latin are linguistically related, but when Latin learning was communicated in Old High German, many of its terms were created in Middle German to accommodate the Latin conceptual world, and the German language was lastingly enriched with novisms denoting concepts of the Classical traditions of learning, in a process parallel to the spread of Greek Christianity into the East European cultures and languages. The book describes some cases of such knowledge transfer and what kind of mechanisms are involved in the ensuing language changes in the receiving languages and cultures. Agenda Estratégica de Investigación para una Europa Multilingüe 2020. Georg, R. and U. Hans (2013). [e-Book] META-NET Strategic Research Agenda for Multilingual Europe 2020. Berlin, Springer, 2013. In everyday communication, Europe’s citizens, business partners and politicians are inevitably confronted with language barriers. Language technology has the potential to overcome these barriers and to provide innovative interfaces to technologies and knowledge. 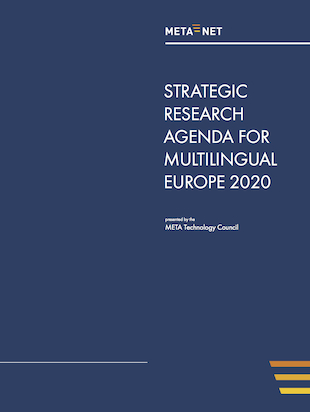 This document presents a Strategic Research Agenda for Multilingual Europe 2020. The agenda was prepared by META-NET, a European Network of Excellence. META-NET consists of 60 research centres in 34 countries, who cooperate with stakeholders from economy, government agencies, research organisations, non-governmental organisations, language communities and European universities. META-NET’s vision is high-quality language technology for all European languages. LANGSCAPE is a plurilingual and multicultural international research network on language acquisition and language education. The current research focus is on Identity Construction in Language Education. This volume summarizes some research results of the last four years by presenting empirical research projects as well as theoretical concepts. The contributions all deal with topics linked to plurilingualism or to certain aspects of the concept of multiliteracies like globalization, language policy, multiculturalism, multimodal communication processes, intercultural learning etc. The authors conceptualize or analyse identity construction processes of learners and educators in different plurilingual and multicultural learning environments or media based settings. Corpas Pastor, G. (2016.). [e-Book] Computerised and Corpus-based Approaches to Phraseology: Monolingual and Multilingual Perspectives. Fraseología computacional y basada en corpus: perspectivas monolingües y multilingües. Geneva, Editions Tradulex. The notion of phraseology is now used across a wide range of linguistic disciplines: Phraseology (proper), Corpus Linguistics, Discourse Analysis, Pragmatics, Cognitive Linguistics, Computational Linguistics. It is, however, conspicuously absent from most studies in the area of Translation Studies (e.g. Delisle 2003, Baker & Saldanha 2011). The paradox is that many practical difficulties encountered by translators and interpreters are directly related to phraseology in the broad sense (Colson 2008, 2013), and this can most clearly be seen in the failure of SMT-models (statistical machine translation) to deal efficiently with the translation of set phrases (used here as a generic term for all categories of phraseological constructions, from collocations to proverbs). Colección Estudios sobre las Desigualdades. El presente trabajo indaga el derecho a la educación y a la diversidad cultural en las primeras declaraciones, convenciones y pactos de la legislación internacional de derechos humanos, desde la Declaración Universal de Derechos Humanos (1948), hasta la Convención Americana (1960) y los dos Pactos Internacionales de derechos civiles, políticos, y de derechos económicos, sociales y culturales (1969). En el desarrollo del análisis normativo se expondrán los presupuestos teóricos del principio universal y del relativismo cultural, tratando de encontrar los puntos más fuertes y débiles en cada teoría. En este sentido, el principio de “igualdad de oportunidades” ligado a la “meritocracia” y a los “dotes naturales” en el derecho a la educación se convierte en problemático y contradictorio. Por último, se destaca la apropiación del discurso de los derechos humanos por parte de los colectivos culturales discriminados, lo cual lo convierte en una estrategia emancipadora. Traditional dialects have been encroached upon by the increasing mobility of their speakers and by the onslaught of national languages in education and mass media. Typically, older dialects are “leveling” to become more like national languages. This is regrettable when the last articulate traces of a culture are lost, but it also promotes a complex dynamics of interaction as speakers shift from dialect to standard and to intermediate compromises between the two in their forms of speech. Varieties of speech thus live on in modern communities, where they still function to mark provenance, but increasingly cultural and social provenance as opposed to pure geography. They arise at times from the need to function throughout the different groups in society, but they also may have roots in immigrants’ speech, and just as certainly from the ineluctable dynamics of groups wishing to express their identity to themselves and to the world. This research topic stems from the IAM interdisciplinary conference, the first of its kind, which will bring together the work of researchers, educators, and policy makers in the areas of first and second language acquisition from psycholinguistic and language pedagogy perspectives. The goal is to provide an opportunity for participants to engage with the implications of multilingualism from a range of perspectives, including the effects of being bilingual from infancy to adulthood, the process and benefits of learning multiple languages, and the impact of multilingualism on society. The unique multilingual setup of our European society imposes grand societal challenges on political, economic and social integration and inclusion, especially in the creation of the single digital market and unified information space targeted by the Digital Agenda. As many as 21 European languages are at risk of digital extinction. ey could become victims of the digital age as they are under-represented online and underresourced with respect to language techno–logies. Moreover, huge market opportunities remain untapped because of language barriers. If no action is taken, many European citizens will find that speaking their mother tongue leaves them at a social and economic disadvantage.Future-proofing our languages requires a modest investment which will return a strong competitive advantage, since the technologies needed to overcome language barriers and support languages in the digital age are key enabling technologies for the next IT revolution.